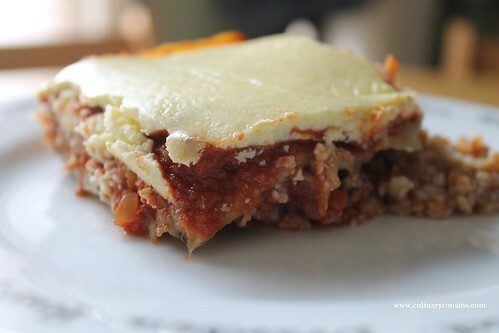 So imagine my delight when I found this recipe for vegetarian moussaka. It’s everything I wanted it to be — hearty, satisfying but still light. Plus, I accidentally bought a box of bulgur when I wanted barley, and a person can only eat so much tabbouleh. This is a great way to use that up — score! The bulgur, when mixed with the tomato sauce, almost, almost, has the consistency of cooked ground beef. If you close your eyes. 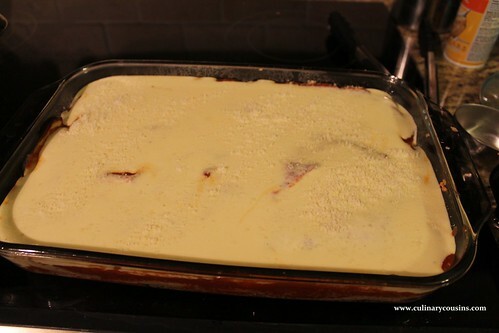 But the spices are the same and the “bechamel” topping is just as creamy, only better for you. Who’s going to argue with that? Add 2 cups of water and about a 1/2 teaspoon of salt to a saucepan and bring it to a boil. Add the bulgur and bring it back to a boil. Cover the pot, reduce the heat to low and let it simmer for 20 minutes, until the bulgur absorbs all the water. Just like you’d cook rice. After 20 minutes, remove the pot from the heat and the lid, place a dishtowel over the pot and re-cover it with the lid. Let this sit off the heat while you prepare the other ingredients. Line 2 baking sheets with foil and brush the foil with olive oil. 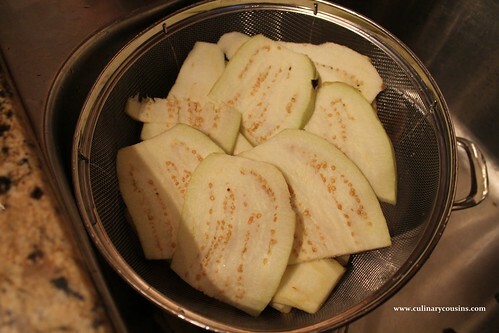 Lay the eggplant slices on the foil and brush them with olive oil too. Roast in the oven for 15-20 minutes, until the eggplant softens and starts to brown. Halfway through cooking, swap the positions of the baking sheets in the oven so they cook evenly. When they’re ready, take the baking sheets out of the oven. Pull up each side of the foil over the eggplant so that it can steam, continue to soften and cool. Heat the olive oil in a medium to large skillet or saucepan over medium heat. Add the diced onion and cook for about 3-4 minutes, until it’s soft and turning translucent. Add the garlic and cook for another minute. Be sure to stir often — you don’t want the garlic to burn, or it will taste bitter. Add the tomatoes, the sugar and the spices: cinnamon, paprika and allspice. Add salt and pepper to taste — about a 1/2 teaspoon of salt and a 1/4 teaspoon of pepper. Carefully taste it to make sure it’s to your liking. Turn the heat up to medium-high and cook until the tomatoes start to bubble. Stir and turn the heat back to medium-low, then partially cover with a lid. Let them simmer and stir often for 15-30 minutes, until the tomato sauce has thickened. Taste it again and add more salt and pepper or sugar if needed. The sugar just cuts some of the acidity of the tomatoes. Turn off the heat and set it aside until the rest of the ingredients are ready. 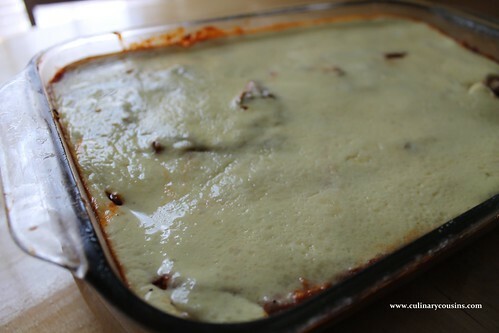 Grease a 13×9 baking dish with olive oil. Spread a layer of tomato sauce on the bottom. Add half the cooked bulgur and spread it over the tomato sauce in an even layer. Next add half of the eggplant slices. 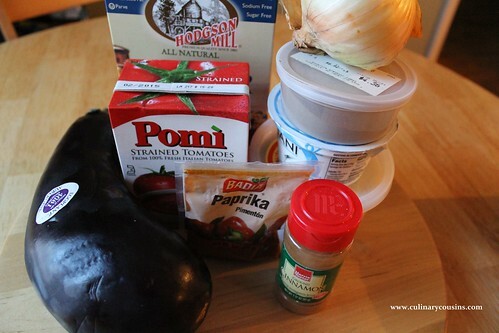 Spoon half of the remaining tomato sauce over the eggplant and sprinkle 2 tablespoons of the grated parmesan on top. 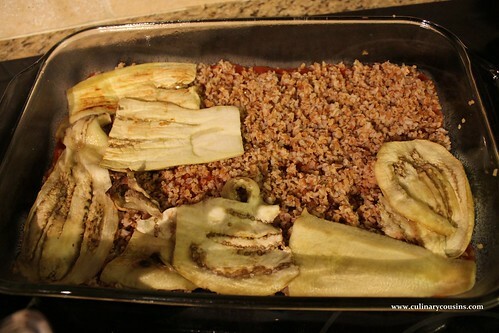 Repeat the layers with bulgur, eggplant and tomato sauce, but omit the parmesan layer for now. In a small bowl, beat the eggs with a fork until the yolks and whites are combined. Stir in the yogurt and 2 tablespoons of parmesan cheese. Add a hearty dash of salt and a few grinds of fresh black pepper. Carefully pour this mix over the tomato sauce and spread it in a thin layer. Sprinkle with the rest of the parmesan cheese. Bake in the oven for 35-40 minutes, until the topping is set and golden. Remove from the oven and let it sit to cool for about 10 minutes before you try to cut and serve it. you can also eliminate acidity in tomatoes with a half tsp of baking soda. Just mix it in, let it sit a bit then taste and add more if needed.